Black she-oak. Image by Ian Moodie. The Black she-oak is an upright, conifer-like small tree with fine, bright green leaves and a dark black, deeply furrowed bark. The female flowers range in colour from red to crimson. The male flowers differ in appearance as they are brown and held on spikes. It flowers from May to June. 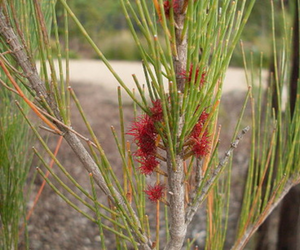 It has dark brown, cylindrical or barrel-shaped woody cones that appear after flowering. It grows best in full sun or semi-shade. It tolerates a wide range of climatic conditions and soil types and performs best on well-drained sites. It is moderate to fast growing and makes a lovely specimen tree. It is suitable for hedge or screen use. The bark can be used to grow epiphytic orchids. Epiphytic plants use other plants for support but are not parasitic. In Boroondara, the Black she-oak can be found in Yarra Bend Park. It food and habitat for cockatoos and parrots. The Glossy black cockatoo is a specialised feeder of the Black she-oak. Blackwood. Image by Ian Moodie. The Blackwood is a fast growing, evergreen tree with glossy green leaves. It grows at a moderate rate to a size of 12m x 6m with an upright, dense canopy. Blackwood flowers from July to October with clusters of rounded, cream or yellow flower heads. The seeds are encased in open, curly shaped pods and can remain dormant for long periods. It thrives in semi-shade to full sun. Blackwood prefers deep, moist soils although it can tolerate moderately heavy, wet conditions or drier sites. It is drought sensitive and resents pruning. It is reasonably hardy and can be useful as a quick-growing screening or specimen tree. In Boroondara, Blackwood commonly grows along our creeks and rivers. Blackwood provides habitat and food for birds and butterflies. River red gum. Image by Ian Moodie. A large, open, spreading tree with smooth bark. It grows to a height of 12m to 50m. It has dull, narrow lance-shaped leaves 250mm x 20mm in size. Certain forms are being planted to combat salinity in inland soil. 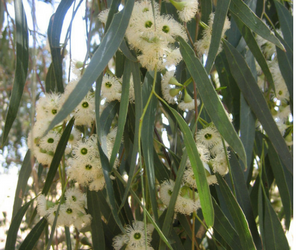 River Red Gum has an abundance of white flowers from October to January. It has long stalked buds in clusters of 7 to 11. It has smooth, cube-shaped yellow-brown seeds, which usually mature during the summer, about a year after flowering. It can grow in full sun. It is excellent in parklands but is probably too large for most suburban gardens. River red gums once spread across most of Boroondara. Now, they are found along the Yarra River and local creeks and in a few isolated sites like Cato Park and Belmont Park. It is an important food and habitat resource with older trees providing vital hollows for nesting. It historically provided the Wurundjeri people with bark for canoes and shields and gum to treat burns. Its water-resistant properties have led to its use in constructing wharves and railway sleepers. Yellow box. Image by Ian Moodie. A tall, majestic tree that grows to a height of 30m and has narrow, grey-green leaves. The characteristics of the tree contributed to its name. It has a bright yellow inner layer of bark and early Australian settlers thought its durable wood similar to English Boxwood. Yellow box has perfumed, cream-coloured blossoms that are an excellent source of honey, hence its botanical name Melliodora, which means honey-scented. It flowers from September to March. The seed capsules develop after the Yellow Box has flowered and can last until the following spring. It is an attractive tree and is suited to large gardens and parklands. It requires a well-drained soil and is drought tolerant. It can be used as an ornamental or amenity plant. In Boroondara, Yellow box is scattered across reserves often as a single specimen tree. It can be seen in South Surrey Park, Cato Park, Kellet Reserve, Beckett Park, Nettleton Park and Willsmere estate. It provides food for caterpillars and nectar for butterflies. It also provides habitat and food for birds. Yellow gum. Image by Ian Moodie. 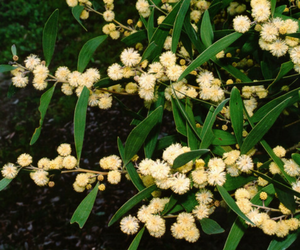 Yellow gum is a fast-growing tree with a spreading crown that grows to a height of 15m. Its leaves are olive green in colour and are shaped like a lance. It has clustered, conical buds on long thin stalks followed by a profusion of cream, sometimes pink, flowers. The brown seeds are oval in shape and slightly flattened. Yellow gum grows in full sun to light shade. 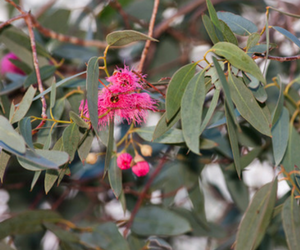 This eucalypt is very tolerant of heavy soils and is also drought tolerant once established. It is an excellent tree for large gardens for the shade and shelter it provides. Yellow gums grow in many areas of central and north Melbourne. 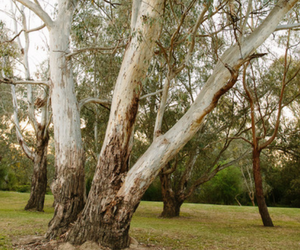 In the Boroondara, they can be seen at Yarra Bend Park, as well in the Serpentine Planting at Beckett Park. It is a food source and nesting site for birds. It also produces an abundance of nectar that attracts bees to your garden.